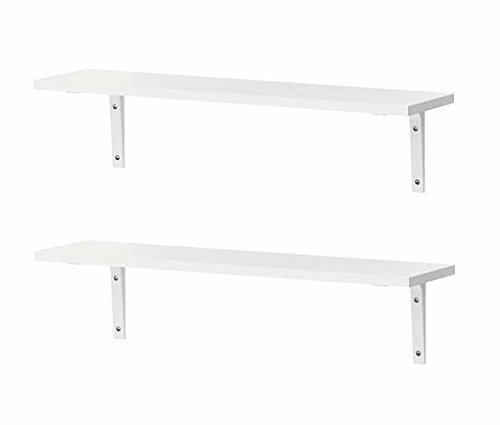 IKEA EKBY Osten Wall Shelves With Wall Mounts [2 PACK AND 4 MOUNTS] [All White] For Kitchen, Dining Room, Living Room, Bedroom Storage. Note listing is for IKEA Ekby Osten Wall Shelf and Mounts Only. Hardware fasteners (such as screws) are not included as different wall materials may require materials. Product Dimensions Length: 31 1/8 " Depth: 7 1/2 ". Thickness is Slightly Less Than 1"
Listing for Shelf and Supports Only. Please Consult Hardware Specialist For Proper Screws/Fasteners. If you have any questions about this product by Ekby Osten and Stodis, contact us by completing and submitting the form below. If you are looking for a specif part number, please include it with your message.